My mothers version was umm.. interesting.. a concoction of processed cheese and heavy cream….and well, tbh, “Velveeta Processed Cheese” isn’t high on my list either. Mom’s version is okay, and it is cheesy tasting. Just not what I always thought Mac and Cheese should be. Yes, I admit it. I never liked Mac and Cheese. I’ve been told I’m just not a good American — what born and bred American doesn’t like Mac and Cheese?!?!!?! I was at a friends house not long ago, and this is the recipe he made for his kids. I was highly amused, as it is a Paula Deen recipe from her restaurant ‘The Lady and Sons’. Apparently, her show on Food Network is one of his favorite shows. He grabbed the recipe from the web site, and has been making it ever since. I can understand his liking of Paula Deen — She is fun to watch, makes fun recipes, and always seems to make me hungry. I’m not sure what it is that makes this actually so good. Butter, eggs and sour cream, probably. And the touch Paula Deen’s recipes always seem to have – that bit of homeyness which makes her recipes down to earth, and classy. Once you have the macaroni cooked and drained, place in a large bowl and while still hot and add the cheddar. In a separate bowl, combine the remaining ingredients and add to the macaroni mixture. Pour macaroni mixture into a casserole dish and bake for 30 to 45 minutes. Top with additional cheese if desired. Mix some Panko (or crushed Saltines or crushed Crispbreads) with melted butter, 1/2 cup grated cheddar and 1/4 teaspoon Paprika and sprinkle over the top before baking. I write two blogs - This Food Thing, (www.thisfoodthing.com) and This Life I Lead (www.thislifeilead.wordpress.com). This entry was posted in Uncategorized and tagged Cheese, Grains, Potatoes, Pasta, Lady's Cheesy Mac, mac & cheese, mac and cheese, macaroni, macaroni and cheese, Paula Deen. Bookmark the permalink. Interesting, I’ve made that recipe in the past and really didn’t care for it. I’m more of a béchamel based macaroni and cheese recipe fan myself. Maybe I have to give this recipe another look. However, now that you mention it as a sauce base for macaroni and cheese, I’ll have to try that again myself. Any suggestions? eww it tastes really gross, i made it. One of the girls in my office feels the same as you, June, but her family (read: Her husband), loves it. To each his own, I guess. I prefer this over any other version, but then again, as I have said, I don’t care for béchamel sauce. I love this recipe but I’ve found that you really need to use sharp or 1/2 medium and 1/2 sharp cheddar for it to taste so amazing. Also it’s so much easier if you mix all the ingredients together and then stir in the pasta. Mixing the cheese into hot pasta is a nightmare. I encourage everyone to try it with the sharper cheeses before giving up. TKB – That is definitely the trick to this recipe. I’ve made this one a few times, but the original recipe I saw had a mixture as well, not just one basic cheddar. It is also best, if you like it more creamy than solid, to take your eggs out to let them sit before mixing them in. They tend to cook before going into the oven, making a more dense casserole. 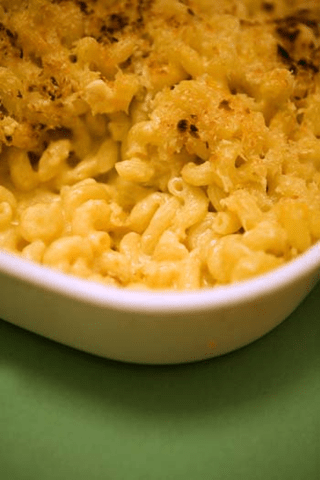 I think if you have the money to make her Ultimate Mac & Cheese, it is soooo worth it! So yummy! But, if I just want to use a cheddar blend, this is about the best that I have had!